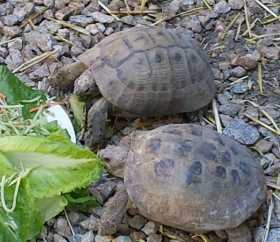 Greek Tortoise escaped on April 4, 2019 from temporary enclosure in Paso Robles, Ca. About 7 -8" long, 5" wide. It is a golden -tan with dark color around each scute. Top tortoise in the picture.